Discussion in 'Tarantula Chat' started by Marvinxox, Nov 8, 2018. 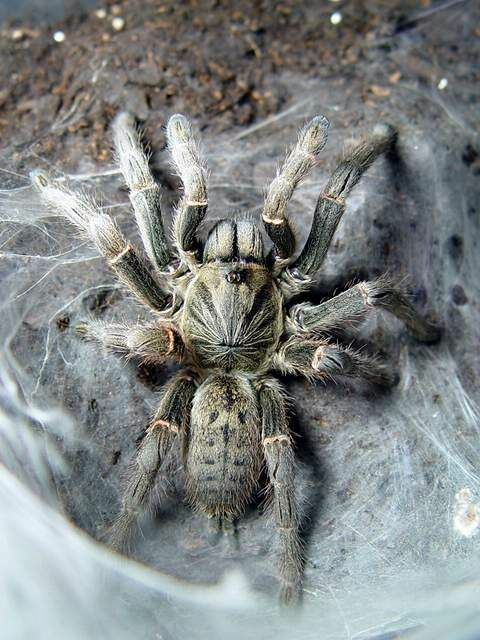 I think everybody know the OBT or the N. incei "Gold", but I don´t know of any other tarantula "Morphs". Does anyone here know about oather tarantulas which are bred in special colours that arent usually found in nature? i think you may be misunderstanding those color forms. Not 100% sure on the N. incei, but the P. murinus color forms are all locality variations that DO redily occur in nature in different areas. i don't know for sure, but i believe that the coloring is also not the same as 'morphs' of say a ball python, where a trait is either shown or not. i believe a cross of the different color forms of the P. murinus (OBT) will just create an inbetween color that can't simply be bred back to normal of either parent traits. The N. incei though i do believe is supposed to be as simple as a dominant/recessive trait. I could be wrong. @KezyGLA is the local expert on P. murinus color forms, perhaps he can shed some light. Edit: CURRENTLY i know that Avicularia avicularia has 6 different morphotypes/varients which would be more similar to the OBT situation, but it should also be said that many seem to dissagree that all 6 of them are actually the same species. Reguardless, i personally would urge people to please only breed spiders of EXACTLY the same type, even if it is a varient of the same species i think it is best to keep them separate. May the Tarantula hobby never become the reptile hobby with all of it’s associated interests in anything morph related. Where morphs become valuable and wild forms become unwanted and valueless in the eyes of beeeders. Yeah, as has been said, these spiders aren't bred to have different colors. They're all naturally occurring genetic differences. In the case of N. incei, that's a simple matter of a recessive gene. In the case of P. murinus, those are localities for the most part. If there is one species that carrys a recessive gene like N.incei there are others.. It just means that either they are deleterious,there hasn't been enough inbreeding or no one has been able to collect and reproduce a specimen that has abnormal color or pattern mutations. I have heard of an LCF "light colour form" Pterinochilus chordatus, too. And then there is Pterinochilus sp "Arusha" which looks like a dark P. murinus or possibly a form of chordatus. And where morphs have value even if they come with detrimental health issues to the animals, like the spider gene wobble in Ball Pythons. Pretty much like several dog breeds. "Let's get something with a predisposition for seizures and respiratory problems because it's fashionable." Ohhh don't even get me started on how mucked up a lot of dog breeds are now! The only 'morphotype'/'locality' that matters is P. sp. 'platyomma' 'Hellbright'. And the antinous locales. That is all. H. devamatha I believe has 2 color forms, and the Phormics can have some color variation between sackmates, but those aren't really color forms. A. seemani had the blue form, and I'm sure there's some other Ts that haven't been listed yet. Oh yeah, and then there's the P. subfusca highland and lowland forms. Isn't lowland form now officially its own species, P. bara? No, the WSC still lists highland and lowland as the same species, P. subfusca. According to @KezyGLA , the African expert, those are localities, too. But yes, P. chordatus color varies a lot. I saw a light variant at the last expo and I didn't like it. What makes P. chordatus great is its dark color imo. V. paranaensis seems to have 2 color variants, too, a brown one and a darker, grey one. I don't know if these can come from the same sac or if they are localities. Yes there is a lighter form of P. chordatus thought to be found farther south east of Mount Kilimanjaro. There is P. chordatus ’Mastov’ which is the darker variant. Deep brown, near black in colour. There is also Pterinochilus sp. ‘Arusha’ which is thought to be chordatus too. It is golden brown/grey in colour. There has also been “Pterinochilus vorax” sold in the hobby at some point but is rare. But I think this could also be chordatus too, as these two species are quite hard to differenciate between when studying taxonomic features. I studied the moult from the above pictured “vorax”, the spermathecae seems to be extremely similar to chordatus but has additional lobes party formed. She is an adult though so if was actually vorax these would be more prominent. I am on the fence with this one. The worst part about it is somewhere along the line of say, a pug, the breeder had a puppy born with a face like a tuna can and said “I want THAT one”. Seriously, how did we get from the majestic wolf to that? They are absolutely hideous, I have no idea how they've become so popular lately. Don't get me started on pugs, just don't... they are a walking health problem disguising as a dog.